Janice, your painting is beautiful! I love the colors and the negative painting. Perfect!!! Thanks, Anna and Sheila! Sometimes the things we just whip out turn out better than those we agonize over. J, Another very cute PEO cover. I love the depth and how the flowers look so natural. You can almost feel the gentle breeze and hear the buzzing of the bees! I just love this one! I could see it on a wall or on notecards...besides the book cover! Actually, I have made note cards using it! Nice and very fresh . . . like a daisy! Janice, I love your art! I found your daisies when looking for PEO yearbook ideas,then read about the painting and the comments. In the comments you said that you've made note cards from the painting--do you sell those? Do I have permission to make some note cards from your image to use at the VA State convention in 2016? Janice, I am the Yearbook chairman for my chapter in TX. 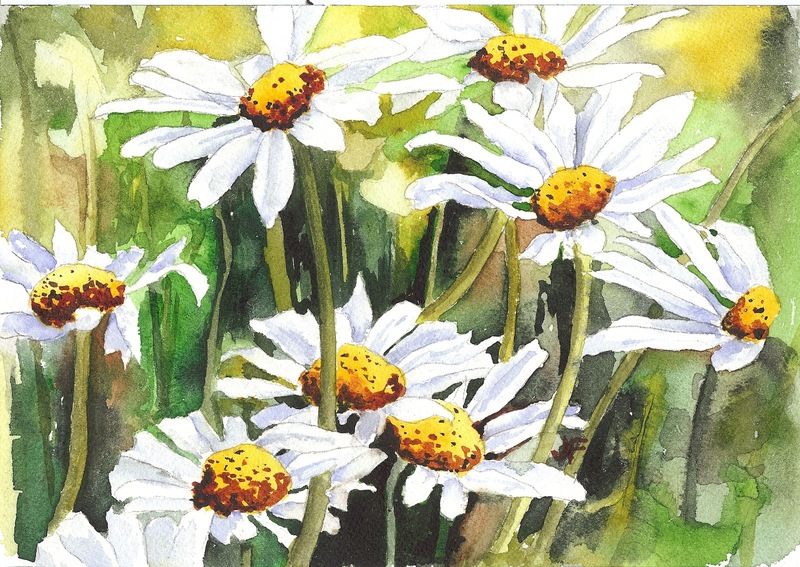 I LOVE your painting of the daisies. How can I go about using it for the cover on our yearbook? I will go to print in about a week. Beautiful painting! It would indeed by nice on cards.